No company knows more about in-line fours than Kawasaki. From the early Z-1 to our factory MotoGP bikes, our knowledge about the in-line four-cylinder engine is unsurpassed. The virtues of this design are many: powerful, smooth running and very compact, if it's a Kawasaki superbike, it has to be an in-line four. Each component of this amazing engine was thoroughly developed to deliver the perfect balance of power, torque, and ridability. Twisting the throttle on the ZX-14 gives the kind of response you would expect from a large bore machine; a seamless spread of awesome torque, right 'round the dial. Big, 1352cc displacement features a bore and stroke of 84 x 61 mm. Revised intake porting provides optimum flow characteristics. Revised piston profiles contribute to reduced mechanical noise. New cylinder head and cylinder head cover have larger secondary air ports (increased approximately 20%), making it easier to get more air into the exhaust system for cleaner emissions. The electric Air Switching Valve (ASV) can also handle more air volume. Windage ports between cylinders reduce pumping losses for increased power output. The monocoque frame is sealed to form the ram-air airbox contributing to the compact layout. New urethane sheet added to the inside of the magnesium chain cover also helps reduce mechanical noise. Already in perfect primary balance, the ZX-14 engine uses a secondary balancer to tame unwanted vibrations, resulting in an extremely smooth engine. Three-phase generator is crankshaft mounted for reduced drive losses. The crankshaft, input shaft, and output shaft are arranged in a tri-axis to create a very compact engine length. Digital fuel injection features ECU controlled sub-throttles to smooth throttle response for “carb like” action. The result is much better rider control and ease of operation. Intake breathes through four massive, 44mm throttle bores for high air flow at top engine loads. New, fine-atomising injectors with droplet size of 75µ increase lateral spray angle from 15o to 20o, dispersing atomised fuel over a wider area resulting in improved power, smoother operation and excellent fuel mileage. Automatic Idle Speed Control system contributes to easy starting. Twin mufflers (each with honeycomb catalyzer) provide ample volume for creating the engines massive power and meeting exhaust emission standards. In addition to the already existing honeycomb catalysers in each muffler, a new third honeycomb catalyser was added in the collector. Entrances to the connecting pipes (joining header pipes 1-4 & 2-3) were enlarged approximately 75% to compensate for the new collector shape (addition of the third honeycomb catalyser). This change in particular resulted in enhanced torque characteristics, especially in the low rpm range. Slick shifting six-speed transmission feeds power to the rear wheel. Direct-actuation shift lever is lighter than conventional linkage-type arrangements and offers a more direct feel. Hydraulically operated clutch features a radial-mount clutch master cylinder for worry-free, silky smooth clutch operation. 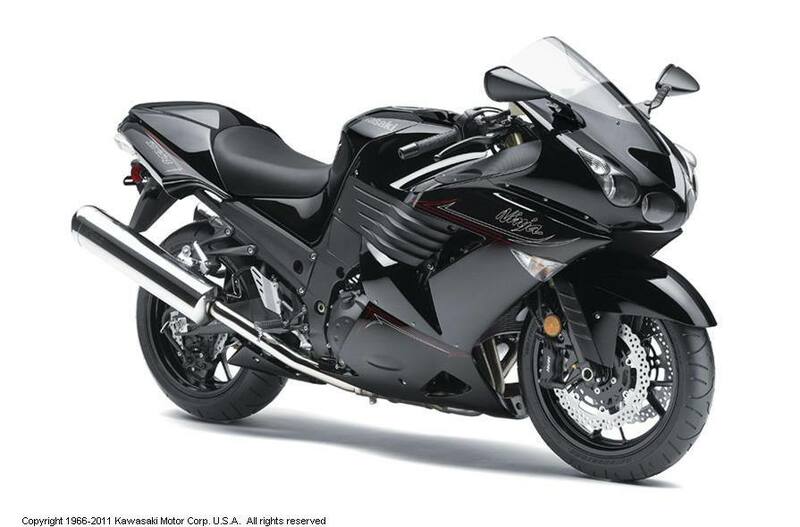 The Ninja ZX-14 runs Kawasaki's exclusive aluminum monocoque frame. Rock steady at speed, and offering responsive handling characteristics, this advanced chassis design strikes an ideal balance between sport riding, and high-speed running on the highway. Our engineers made full use of the design freedom given to them by the engine's compact size. The engine's position forward in the frame, the wheelbase and front/rear wheel weight balance were all carefully chosen to achieve both high-speed stability and responsive handling. Aluminum monocoque frame represents a further evolution of the frame first used on Kawasaki's KR500 racer then in production on the Ninja ZX-12R. This advanced design makes possible a very slim, compact package. Fuel mass is located at the rear of the “tank” and extends below the seat, further contributing to the centralized mass. Already inherently more rigid than twin-spar frames, with the engine rigid-mounted the torsional rigidity is further increased. Using the engine as a stressed member allows the frame to be made lighter. New die-casting process for the main frame sections results in a lighter frame. Massive head pipe casting also contributes to the high rigidity. Bolt-on, aluminum rear sub-frame includes tall side plates contributing to the unique styling and creating a very narrower mid-section. Monocoque frame design creates a void inside the frame that is used to house various electrics including the M-F battery. The hollow section of the frame behind the steering head serves duty as the airbox for the ram-air system. The combination of the monocoque frame with rigid-mounted engine and a mass located at the centerline gives the ZX-14 extreme stability at high speeds. Chassis is narrow through the middle for superior rider control. Engine and chassis components were all designed to maximize mass centralization. Inverted, 43 mm cartridge fork uses a large diameter, hollow axle for light weight and precise steering feedback. Fork includes adjustments for compression damping, rebound damping, and ride height. Uni-trak linkage rear suspension complements the highly rigid frame, offering both great controllability at high speeds and superb road holding ability when sport riding in the hills. Gas charged piggy back reservoir shock includes adjustments for compression damping, rebound damping, and spring preload. Formidable front brake performance is further enhanced with a radial-pump master cylinder that offers superb feel at the lever. Semi-floating, drilled, petal style, 310 mm front brake rotors are gripped by Nissin, radial mount, 4-piston, 4-pad calipers. Rear brake features 250 mm, drilled, petal style rotor and 2-piston caliper for additional stopping power and improved braking feel. Wheels feature center ribs that are slightly offset so that tire balance weights can be located at the wheel centerline. Use of four individual brake pads promotes even heat distribution across each pad virtually eliminating fade due to pad warpage at high temperatures. Rearbrake features 250mm, drilled, petal style rotor and 2-piston callipers for additional stopping power and improved braking feel. Newly designed wheels feature centre ribs that are slightly offset so that tire balance weights can be located at the wheel centreline. In spite of the ZX-14's awesome performance, the machine is surprisingly non-intimidating. This is due as much to the seamless power delivery, as it is to the smooth ride and its rider-friendly ergonomics. On the ZX-14, the typical weekend jaunt leaves the rider refreshed and invigorated. Despite its long and low appearance, the ZX-14 offers a very relaxed sport riding position. Compact without being cramped, the bars are positioned so that riders do not have to stretch to reach them. Low-set footpegs give ample legroom. The low seat height and narrow seat front make it easy to reach the ground when stopped at lights. The narrow engine, monocoque frame, and waisted fuel tank make it easy to keep knees comfortably close together when riding. A depression in the fuel tank cover facilitates tucking in behind the screen. The ZX-14 exudes an aura of power and assurance found only in the world's most powerful machines. As befits its flagship status, the ZX-14 offers a combination of avant garde design, meticulous craftsmanship and attention to detail. Whether parked in front of a café or zooming effortlessly down the highway, this is a machine people will notice. The ZX-14's bodywork gives it extremely long and low styling. The front cowl extends well over the front wheel and the fairing almost hides the front wheel. All the lines of the bike move from front to rear, giving the bike an impression of speed even when it standing still. Because the monocoque frame goes over the engine and does not protrude through the fairing, a smooth, uninterrupted fairing design is possible. The ZX-14's multifunctional aerodynamics package reduces drag, adds stability at highway speeds and keeps you out of the wind when sport riding in the hills. Raised “Kawasaki” and model emblems contribute to the classy styling. Long front fender with aerodynamic side wings contributes to the ultra high speed potential of the ZX-14. Fuel tank features a flush-surface tank cap. A small under-cowl forward of the rear wheel contributes to the bike's flowing lines. This under-cowl is removed when fitting the optional center stand. LED tail lamp features a unique “V” design. This will be the most common view of the ZX-14 on the move. Front and rear turn signals are integrated into the fairing and rear cowl. Clear signal lenses with orange bulbs contribute to the high quality appearance. Standard equipment solo seat cover complements the aerodynamic styling. Removing the cover reveals the seat beneath. Quadruple projector beam headlights adorn the ZX-14's front cowl. The outer lights contain position lamps and the high beams. Low beams are in the two center lamps. All four beams on (when HI beam selected) creates enough light to turn night into day. Central Ram Air duct like that of other Ninja models gives the ZX-14 a consistent Kawasaki face. Nestled in the canopy is an instrument cluster with LCD information centre and dual electric analog gauges for speedometer and tachometer. White meter faces with black lettering makes the meters easy to read in daylight. Meter faces look black with white lettering and the meter needles glow red at night. Multi-function LCD digital display language can be set for English or French. Display can also be set for litres, US gallon, or Imperial gallon. Shift and engage indicator lights can be set individually for bright, dim, blinking, or off. Use of CAN interface between the meter and the ECU reduces the number of cables and allows a greater volume of information (e.g. fuel consumption) to be exchanged. CAN (Controller Area Network) is the latest generation On Board Diagnostics interface system. Anti-theft circuit built into the ignition switch and ECU prevents hotwiring by joy riders. Steering Angle (Left/Right): 30 deg./30 deg.